Falcon 4 BMS 4.32 is the best version of the venerable Falcon 4 F-16 simulation to date. Bringing in modern "features" such as a fully-working, fully-clickable 3D cockpit with working gauges while still retaining the depth of Falcon 4 all for the low, low entry price of $0.00/�0.00/EUR0.00 (price dependent on your location of course), it is no surprise that it is attracting people from the I-got-no-clue-how-to-do-the-Falcon-dance new pilots to those who've spent a few months/years with the various other flavors of Falcon (OF/FF/AF) and are giving the sim "another chance" to those who've flown Falcon 4 for over a decade and can recite checklists in their sleep. However, the install procedure for Falcon 4 BMS can be quite confusing. 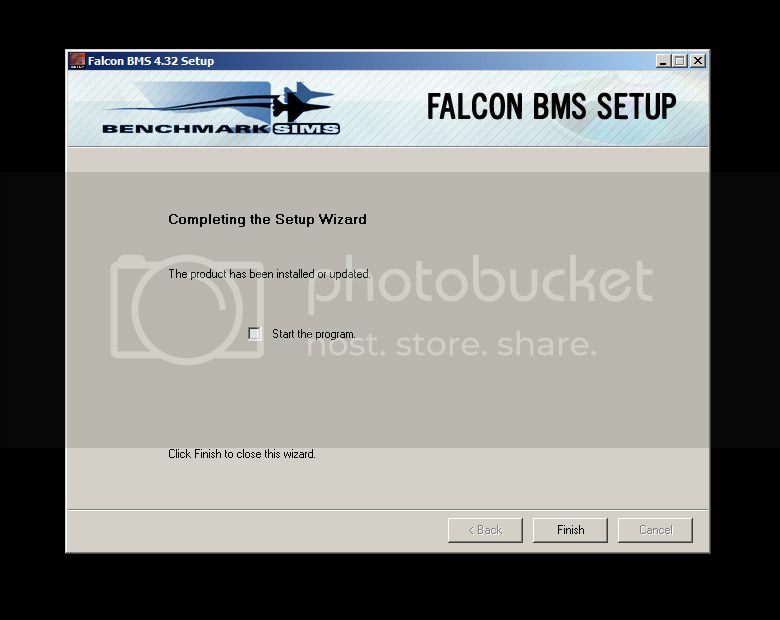 First of all, the BMS installer will look for the original Falcon 4 .exe file. Yes, the original one, so Falcon 4 Allied Force will not work... and this is where most people get confused. So yes, you will have to find a copy of the original Falcon 4.0, eBay and Amazon are good sources, or another virtual pilot can probably lend you his CD, but be prepared for total annihilation if you so much as scratch the CD!! I was lucky enough to get a free copy from Reschke early 2011 and surprisingly BMS came out by September, so thanks Reschke!! Another common source of confusion is the installer and Update process that BMS is using. It is quite unique and difficult to use at first, though it kinda makes sense after a few Updates So here is the install process that I hope will help new pilots get from "WTF?!" to "OMG, this RAWKS!" in as short a time and as pain free as possible. 1. Download the relevant files from the BMS website. You should end up with 4 files, the zipped base installer and the 3 Updates. 2. 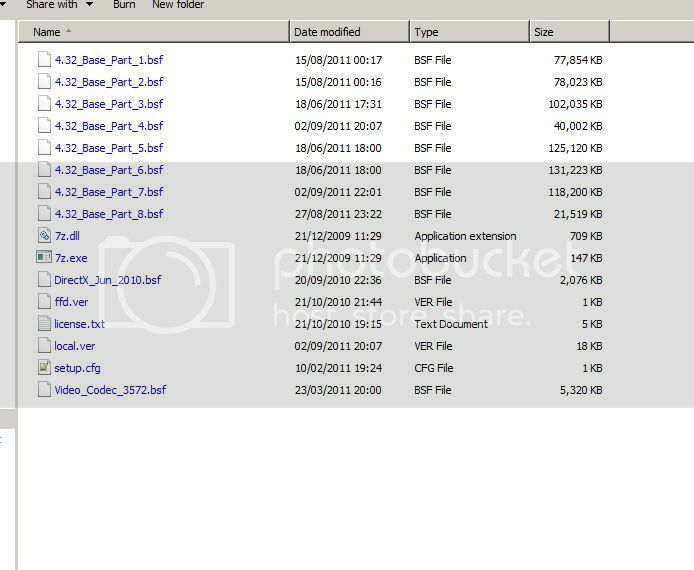 Unzip the installer and you should get these files under \Falcon_BMS_4.32_Setup\Falcon BMS 4.32 Setup folder. If you only get the \Falcon BMS 4.32 Setup folder, delete that and unzip the folder again using the "Extract to [folder name]" command and not "Extract Here"
4. Double-click Update 1 to apply it to the base installer. 5. Navigate to your \Falcon_BMS_4.32_Setup folder and notice that it'll append the \Falcon BMS 4.32 Setup at the end of the line, that is why Step #2 above is important! 6. 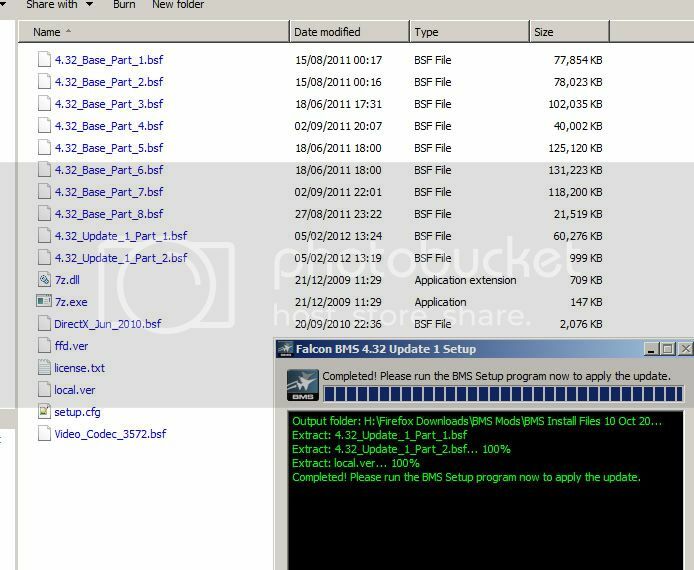 After a few seconds, it'll finish applying Update 1 and now your /data folder will show the Update 1 .bsf files. And that's it! You now have your base installer updated and it will install BMS and automatically apply all updates to your sim! EDIT: Updated the steps and pics to reflect a clean install. EDIT: Clean Install of Update 4. 10. Double-click the Setup.exe file and you will see this window first. Click Next. 11. EULA... Read if you can! 12. 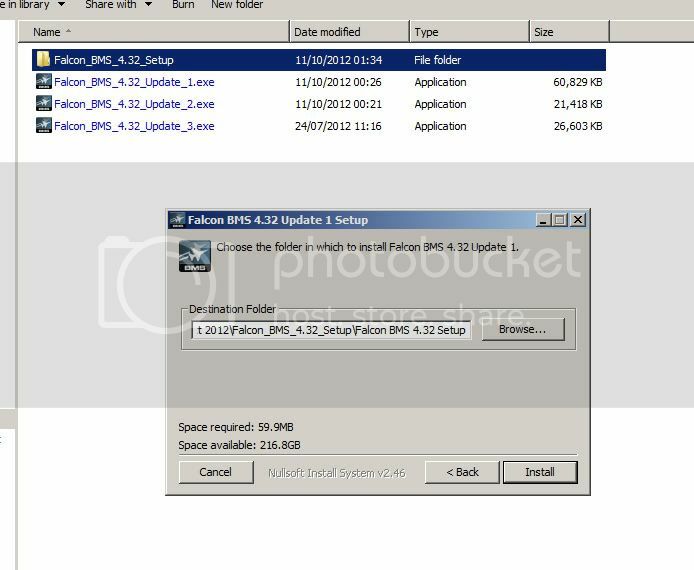 Point the installer to your Falcon 4 CD or a folder that contains the .exe file. Again, you will need the ORIGINAL Falcon 4 CD, Allied Force will not work. 13. Select where you want your copy of Falcon 4 BMS to be installed to. I placed it on my C: drive as that is my SSD drive. 14. The installer will now check whether all the files have been downloaded properly. 15. After verification, it should recognize that you have the base BMS program and all three four Updates downloaded and ready to install. 16. Just select all the files under the Downloaded box, click Next, and the install process should begin! 17. BMS is now being installed on your PC! 19. And that's it, done! Falcon 4 BMS is now installed! 19a. You can re-run the setup to check what you have installed. 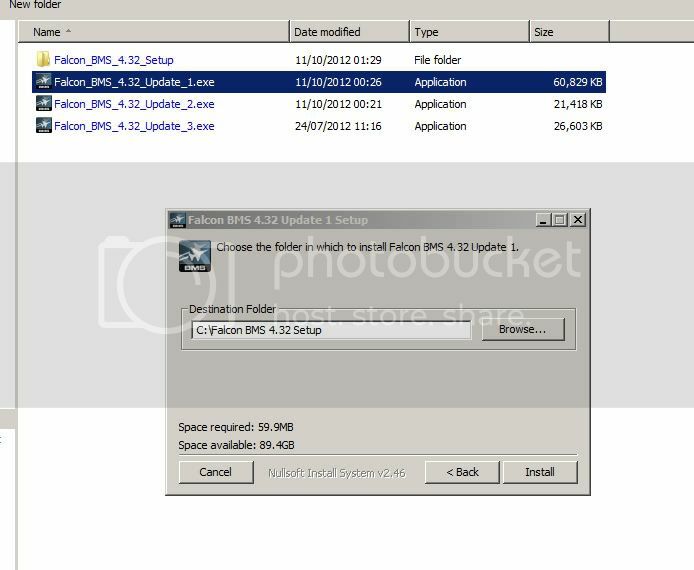 The installer will again verify the files you have on your PC. This is how it should look like with Falcon 4 BMS Update 4 installed. There is NO NEED to install Falcon 4.0 before, during, or after installing BMS. The BMS installer will simply look for the .exe and will install BMS once it is happy with the presence of the .exe file. 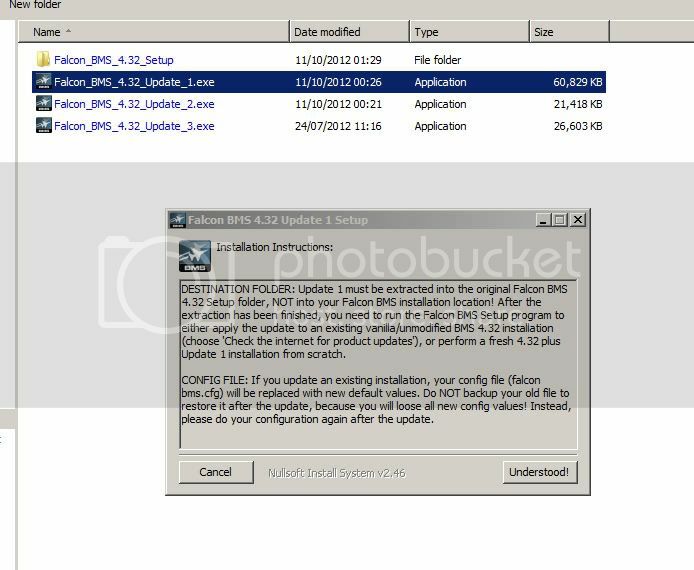 Falcon 4 BMS will NOT need the Falcon 4.0 .exe or CD anytime after the install. The .exe check is a one-time check during installation; you can play BMS afterwards with no need for the Falcon 4.0 CD so keep that CD in a safe place! So there you have it! Falcon 4 BMS install procedure --- the new Falcon 4 dance! Enjoy! Changed first post to include Update 4. Thanks for this - ICE, you da Man! Glad to have helped, sir! Note that I do not take any responsibility for lost time, money, wife, kids, jobs, or any other items of "value" due to the installation of this sim. the sky (and the enemies) with. You're welcome. IIRC, BMS now has a U1-U6 installer so all you need to do is add in U7.